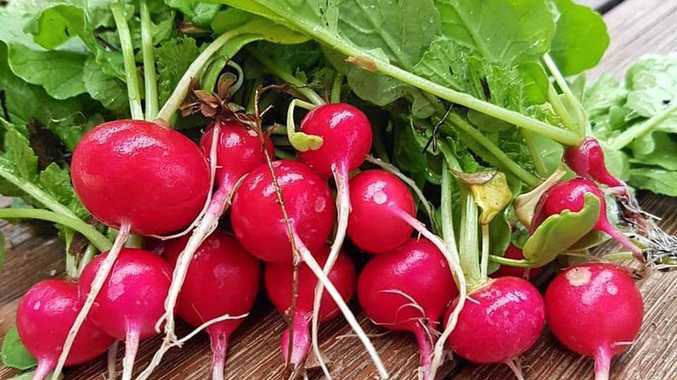 IF YOU'RE after a quick vegie to grow during the heat of summer then try some radish. Radish can be used in delicious summer salads and made into tangy spreads, dips and salsa. Yates Radish White Icicles have beautiful long snowy white roots with crisp tender flesh. They're easy to grow and will be ready to harvest in six to eight weeks. White Icicles should be sown directly where they are to grow, in either a sunny vegie patch or in pots, with seedlings emerging in five to eight days. To encourage healthy growth, feed each week with Yates Thrive Vegie and Herb Liquid Plant Food and harvest the roots while they are still young and tender. Sow more seeds every two weeks for an ongoing supply. Radish is also available in seed tape, a super simple way to start growing. Make a 1cm deep furrow in a garden bed or pot, lay down the tape (cut to the required length), cover with soil, water and you're done. Incorporating lots of organic matter into the soil can improve its moisture-holding capacity, encourage earthworms that help to aerate the soil and provide food for beneficial micro-organisms that convert organic matter into plant nutrients. Yates Dynamic Lifter Soil Improver and Plant Fertiliser is a rich source of organic matter and mixing it into the soil before planting new plants or gently mixing it into the soil surface around existing plants can improve soil quality. Applying organic mulch around the root zone will help conserve moisture and keep the roots cooler in summer.